This print proves that true love can be found anywhere, but only between a few special species. Jacqueline Schmidt assembles couples from land, sea, and sky in her print that proves that true love can be found anywhere, anytime, but only between a few very special species. We know wolves run in packs, but in fact, these paired-up pooches prove that the phrase "lone wolf" is a total misnomer. Angelfish respect the sanctity of their one-and-only relationship, Gibbon monkeys stay together for the swing of it, and hawks, swans, cranes, and pigeons are all proven lovebirds. Even termites show that the couple that shares an appetite for good things in life is destined for a fruitful relationship. This unconventional take on amore makes for an ideal gift for the nature lover or an affianced, newlywed, or just wildly romantic couple. Made in Michigan out of 100% recycled newsprint paper. 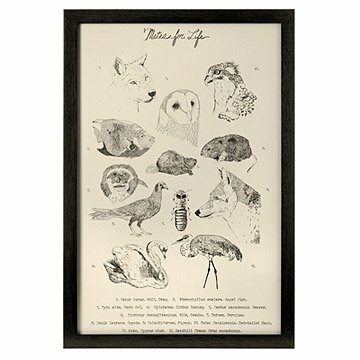 Comes ready to hang in black frame or unframed, mounted in a protective plastic sleeve. My partner and I just bought a cabin in the woods outside of Nashville, it's our first home and we loved the print! Crisp black lines and quality paper. I got a magnetic wood hanging frame and it looks great. This was a great gift for an eclectic couple! My wife loved this. It is very "us" stylistically and we had a spot for it right out of the Christmas wrapping paper she put it on the wall! I bought this as a gift for my husband for our wedding anniversary. It is just as pictured and is such a unique gift. I would definitely recommend this item! I love the old school look to this print. I love the color, the style, and the subject matter. Truly is eternal love. My husband and I have had many conversations about mates for life, and seemed appropriate for our home. I am very excited to gift this to my boyfriend for our anniversary. Print is very beautiful and a nice size. Decided to skip the frame and buy one separately. Shipped quickly and nicely packaged. This print is beautiful and was just as I had hoped it would be. My husband loved it for our anniversary!